Jesse Schmidt returns to the Barnstoremers for a fourth season in 2013. Last year he was named to the all AFL first team, as he led the league in receptions (172), yards (2218) and touchdowns (58). For the second straight season, he broke every Barnstormers receiving record. His 336 points scored were also tops in the AFL. He was a unanimous decision for the Barnstormers MVP award. 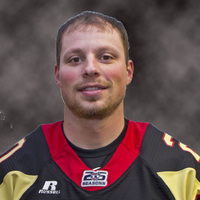 Schmidt is a seven year veteran of Arena Football, having played for 3 seasons in af2 with the Quad City Steamwheelers, before joining the Barnstormers in 2010. College: Finished his college career with 132 catches for 2314 yds and 33 touchdowns. Was named to Dan Hansen’s All West Region Team along with being named First Team All Conference three times. Participated in the Aztec Bowl and broke numerous school records. The best thing about living in Iowa is: It's the best state in the U.S.